Ayahuasca is a sacred drink used for millennia by numerous indigenous groups primarily in the Upper Amazon and Orinoco basins for divination, healing, and other cosmogonic/shamanic purposes. The Ayahuasca Reader is a panorama of texts translated from nearly a dozen languages on the ayahuasca experience. These include indigenous mythic narratives and testimonies, religious hymns, as well as narratives related by western travelers, scientists, and writers who have had contact with ayahuasca in different contexts. Some of the material in this REader has been published before in difficult to find journals and books in a variety of languages. In many cases, the authors have produced their contributions expressly for this anthology. The many contributos include Fracoise Barbira Freedman, Wade Davis, Philippe Descola, Allen Ginsberg, E. Jean Matteson Langdon, Peter Matthiessen, Dennis McKenna, W.S. Merwin, Ib Michael, Richard Spruce, And Gerardo Reichel-Dolmatoff. 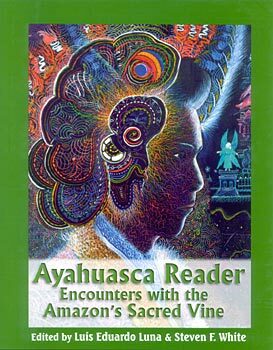 The Ayahuasca Reader represents the most comprehensive collection of authoritative writings on the subject ever published. The editors are Dr. Luis Eduardo Luna, Colombian-born anthropologist, author of Vegetalismo: Shamanism Among the Mestizo Population of the Peruvian Amazon, and co-author with Pablo Amaringo of Ayahuasca Visions, and Dr. Steven F. White, who teaches in the Caribbean and LAtin American Studies Program at St. Lawrence University. This book, with its "anthropoliterary" perspective, is a must for anyone interested in learning about the fascinating properties and effects of the Amazon's most sacred vine.